On December 04, 2016, about 1453 central daylight time, N161SY, an Embraer ERJ170 200L, operated by SkyWest Airlines, experienced an uncommanded retractionof the nose landing gear during rollout after landing on runway 4 at the San Antonio International Airport (KSAT), San Antonio, TX. The aircraft was originally scheduled to land at General Mariano Escobedo Int'l Airport (MMTY), Monterrey, Nuevo Leon, Mexico. However, after departure from the George Bush Intercontinental Airport (KIAH), Houston, Texas the crew heard a loud "thud/pop" just aft of the flight deck. Because no warnings or indications were displayed on the flight deck, the crew decided to proceed to MMTY. When the landing gear was extended on approach, the crew received warning indications regarding the landing gear position and a "LDG GEAR LEVER DISAGREE" message. The crew declared a missed approach, retracted the landing gear per the quick reference handbook (QRH) procedures, and elected to divert to KSAT. Upon entering US airspace, the crew declared an emergency and performed a flyby of the control tower to verify landing gear position. The tower confirmed that the gear appeared to be in the down position. After touchdown on runway 4, during the landing rollout the nose gear retracted, without command, as the aircraft slowed to a stop. The crew and passengers evacuated the aircraft from the aft cabin doors via the evacuation slides. The airplane sustained minor damage. The flight was conducted under the provisions of 14 Code of Federal Regulations Part 121. Visual meteorological conditions prevailed and a Federal Aviation Administration (FAA) flight plan had been filed for the flight. The event airplane, an Embraer ERJ 170-200 LR, registration N161SY, serial number 17000569, was manufactured and delivered to the operator in 2016 and had accumulated 1,310 hours and 740 cycles. The NLG downlock springs were installed during manufacture and had accumulated the same time and cycles as the airframe. One minor injury was reported by a passenger which occurred during the evacuation of the aircraft. Scraping damage was reported to the lower fuselage skin, forward of the nose landing gear bay and the nose landing gear doors. Minor scraping to the underside of the right-hand engine nacelle was also reported. During the aircraft recovery, a failed downlock spring was found lodged in a lightening hole in the nose landing gear yoke, which obstructed the downlock operation for the nose landing gear. The aircraft was equipped with two combination Cockpit Voice Flight Data Recorders (CVFDR) which recorder identical sets of voice and parametric data. One CVFDR was sent to the NTSB Vehicle Recorders laboratory in Washington, DC for examination. The CVFDR recorded relevant data for landing gear and hydraulic system for the incident flight, and several previous flights. Due to the successful download of the stored data the other CVFDR was not downloaded for the investigation. The Flight Data Recorder Specialist's Factual Report can be found in the pubic docket for this incident. The NLG downlock springs were removed and shipped to the NTSB Materials laboratory in Washington, DC. The right NLG downlock spring was received intact. The left NLG downlock spring was received in two separate pieces. The NLG downlock spring separated in the ninth coil from the lower end due to progressive crack formation. No evidence of overstress was observed. During a visual inspection, external surfaces of the downlock spring wire had small openings, which resulted in surface roughness measurements that were above the allowable limit set by Embraer. Cross-sections prepared through multiple downlock spring coils along the length of the spring showed intergranular cracking at the openings. The openings and cracking were associated with white etching microstructure of the wire that was consistent with retained austenite, while the base material of the coils had microstructure consistent with martensite, as specified. The amount of retained austenite in a circumferential surface layer of the downlock spring coils was above the allowable limit specified by Embraer per AMS 5678. Two spring pieces (an end segment and a ring segment) were documented using radiographic images. The computed tomography (CT) slice images were examined, processed, and analyzed by the NTSB to evaluate the components. The results of the CT imaging were inconclusive in locating crack location in the spring segments. The manufacturer provided information to the NTSB regarding additional NLG and MLG downlock springs that failed during operations. The spring from this incident was the only one which resulted in an uncommanded gear retraction on landing. Manufacturing records for the incident spring were reviewed and compared with other events. The manufacturer identified a suspect batch of raw material for the springs, common to multiple events and springs with higher than allowable amounts of retained austenite. The aircraft manufacturer performed multiple quality audits throughout the supply chain for the spring manufacturing process and shared the results with the investigative team. On March 1st, 2017, Embraer released a retrofit letter, in conjunction with service bulletins for the E170/175 and E190/195 fleet. The letter addressed an inspection and possible replacement of the NLG downlock springs manufactured from certain material batches. Injuries: 1 Minor, 54 Uninjured. 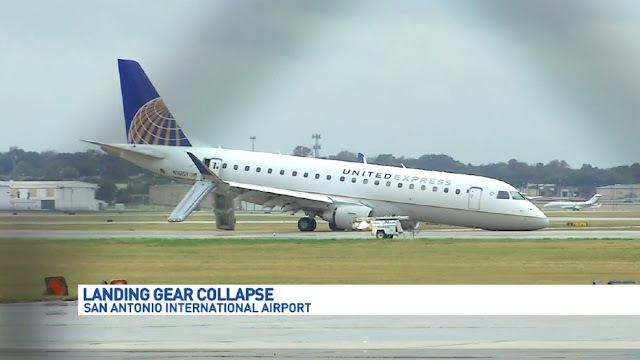 On December 04, 2016, about 1453 central daylight time, N161SY, an Embraer ERJ170 200L, operated by SkyWest Airlines, experienced a collapse of the nose landing gear during rollout after landing on runway 4 at the San Antonio International Airport (KSAT), San Antonio, TX. The aircraft was originally scheduled to land at General Mariano Escobedo Int'l Airport (MMTY), Monterrey, Nuevo Leon, Mexico. However, after departure from the George Bush Intercontinental Airport (KIAH), Houston, Texas the crew heard a loud "thud/pop" just aft of the flight deck. Because no warnings or indications were displayed on the flight deck, the crew decided to proceed to MMTY. When the landing gear was extended on approach, the crew received warning indications regarding the landing gear position and a "LDG GEAR LEVER DISAGREE" message. The crew declared a missed approach, retracted the landing gear per the quick reference handbook (QRH) procedures, and elected to divert to KSAT. Upon entering US airspace, the crew declared an emergency and performed a flyby of the control tower to verify landing gear position. The tower confirmed that the gear appeared to be in the down position. After touchdown on runway 4, during the landing rollout the nose gear collapsed as the aircraft slowed to a stop. The crew and passengers evacuated the aircraft from the aft cabin doors via the evacuation slides. During the aircraft recovery, a failed downlock spring was found impeding the downlock operation of the nose landing gear. The downlock springs from the nose landing gear have been retained by the NTSB for further examination. The airline transport pilot and passengers was not injured. The airplane sustained minor damage. The flight was conducted under the provisions of 14 Code of Federal Regulations Part 121. 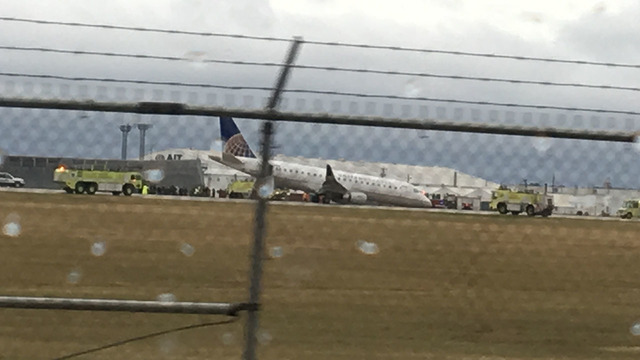 Visual meteorological conditions prevailed and a Federal Aviation Administration (FAA) flight plan had been filed for the flight.